Weekly flights to Sanford in Florida will take off from Doncaster Sheffield Airport for the first time next summer, and to Cancun in Mexico from the summer of 2020. The addition of the long haul routes to the airport’s roster reflects not only the ambitions of TUI UK, the UK’s largest holiday operator, but is also in line with aspirations for a wide area around the airport. While holidaymakers will welcome more choice of destinations, local public and private sector leaders increasingly have aviation-led economic growth on their radar for the benefit of Doncaster, Sheffield City Region and the North in general. The vision is of an ‘international gateway to the North’, with an expanding airport in tandem with excellent motorway, rail and even deep water port connections. Yet Doncaster’s regeneration hopes stretch much further. Looking across the whole borough, Doncaster Council says it is leading a “bold, innovative” approach that will see £349m invested over the next four years. It all helps to generate optimism for the economic future of ‘Donny’, which is reinventing itself after the decline of the coal mining industry. Certainly, things are looking up at DSA. 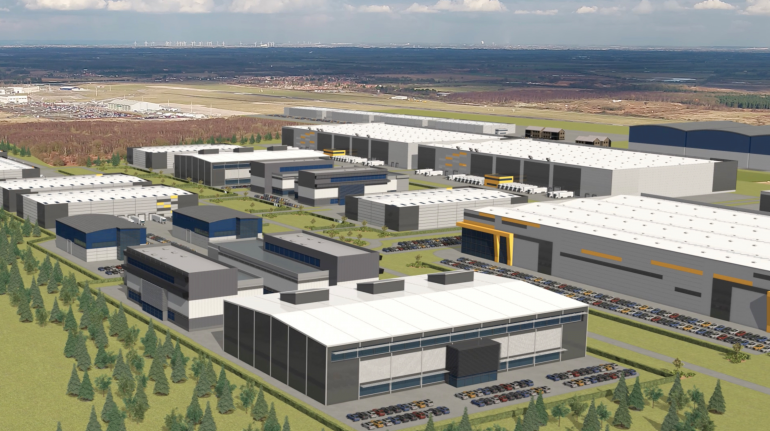 In October, a planning application was submitted for a large logistics and advanced manufacturing hub next to the airport as part of Aero Centre Yorkshire, already a thriving business community of more than 100 companies. Due to be fully operational in 2025, it is estimated the 3.5m sq ft development by airport owners Peel Land and Property will generate 5,300 jobs, with a long term cumulative economic impact of up to £1.94bn. Robert Hough, chairman of Peel Airports, highlighted the advantages of “direct motorway access, a vibrant regional skills base, high quality land, international connectivity and the region’s world-renowned research and innovation strengths”. And he was confident that Peel’s latest scheme would attract more significant global brands into the region’s emerging Global Innovation Corridor as well as supporting the continued growth of the airport. It maintains the momentum behind Aero Centre Yorkshire – a 1,600 acre site whose occupiers include 2 Excel Aviation, Cessna, Redline and Anglo World Cargo. Last year it was selected as part of the Government’s Northern Powerhouse Investment Portfolio, one of only 12 projects chosen to help boost investment in the North. Things speeded up last June with the completion of the Great Yorkshire Way, the £56m three-mile link road from Junction 3 of the M18, reducing highway congestion and journey times for passengers, especially those travelling from Sheffield, Leeds, Rotherham and Barnsley. The benefits run much deeper, though, opening up major employment and housing sites, in line with the ambitions of business and political leaders in the Sheffield City Region and with the Government’s Northern Powerhouse. It certainly helps iPort, the growing logistics hub and strategic rail freight interchange, four miles from DSA, next to the M18 and connected to the electrified East Coast Main Line. Developers and operators Verdion describe it as “the UK’s most advanced multimodal logistics hub”. It is estimated there is the potential for up to 5,000 jobs, with businesses such as Fellowes, CEVA Logistics, Lidl and Amazon already on board. The Amazon unit – one of three in Doncaster – is the size of 15 football pitches. Already DSA passengers flying to numerous destinations across Europe from the former RAF Finningley have been won over. It was named best airport in the UK 2018 by Which? Magazine for the second time in a row. A 20-year masterplan has set no less a target than becoming the UK’s most outstanding regional airport, attracting more passengers, increasing cargo operations and doubling the size of the terminal. Bold, but achievable, it is argued, highlighting DSA’s capacity to provide international connectivity for up to 25m people and handling 250,000 tonnes of cargo a year. One particular, and hugely significant, ambition remains on the horizon – an airport rail station to link into the East Coast Mainline. A range of prominent public and business groups, including Peel Airports, Transport for the North, the Mayor of Doncaster, Ros Jones, Chambers of Commerce, the Sheffield City Region Local Enterprise Partnership and Welcome to Yorkshire are keeping up the pressure. Sheffield City Region Mayor Dan Jarvis sees the proposed station as “truly game-changing” for DSA and the North of England, creating up to 73,000 new jobs and a multi-million-pound boost to the economy. He believes the airport can do for the east of the Pennines what Manchester Airport does for the west. The station is predicted to cost around £280m, which compares with the many billions of pounds being spent on HS2 and Crossrail in London, it is argued. Ultimately, the Government will decide whether to back the project. Doncaster Chamber, which represents business interests across the borough, describes DSA as “an incredibly important part of the local economy and jobs market” and highlights the importance of the Great Yorkshire Way in opening up a corridor for further business expansion, including at the iPort. Rebecca Leam, Head of Policy and Communications, says: “It’s important that Doncaster is outward looking and interacting positively not just locally, but regionally, with UK plc and with global markets and opportunities. “A big priority is to increase exports which are lower than comparative cities and much lower than the national average. However, there are important issues to address. They include rising to the challenge of increasing the proportion of knowledge intensive/high-tech jobs, helping to improve wages and the quality of living. Skills and education have been long-term challenges for Doncaster, adds Rebecca. A more general point is made, though.